No, I don’t have shingles again, but I noticed that it’s one of the biggest searches that brings people here. To skip to posts that mention shingles, click here. I’ve had shingles three times. The very first time, I had no clue what it was. Each time thereafter I did. There have been clear signs that I was going to have a case. In advance of the rash, I felt generally unwell. My most recent outbreak was on the left side of my head, and was preceded by an earache, headache and sore throat just on that side. Each time, the skin in the area where the rash would soon appear was extremely sensitive and sometimes felt almost as a burning sensation, but very mild. Once the rash appears, there can be itching and sharp stinging. Sometimes the stinging is enough to make me say ouch! Even after the rash clears up, there’s still some stinging and itching. It eventually wears off, but I still have itching on my head where the rash used to be. Certain spots are still extremely sensitive at times. I’ve been told that it’s necessary to start an anti-viral such as Famvir as soon as possible to lessen the likelihood of post herpetic neuralgia, but that it will not be effective if started too late. If the rash has been present for more than 3 days, it may not do any good to be on an anti-viral. Some myeloma patients are on an anti-viral persistently in an effort to prevent the ocurrance of shingles. I’ve not done that, because I don’t like the side effects of the drug Famvir, which gives me headaches. Shingles is caused by the varicella zoster virus, which is the same thing that causes chicken pox. If you have never had chicken pox, you won’t get shingles. You can get chicken pox from someone who has shingles though! This is what my head looks like now. The rash is gone. There’s discoloration there, and the skin is extremely sensitive. Sometimes it itches, too. I have another appointment to see the eye doctor on Tuesday, and I think it will be the last one for this. If you’re wondering, the thing sticking out of my ear is from my iPod. This has been the first time I’ve tried to use it since before I had shingles. The virus caused pain even in my ear, which made it hurt to listen to music or even the telephone on that side. I still have headaches on the left side of my head, but they’re not as bad and not as constant as they were even a week ago. You can see that my hair is growing. I hope to look half way normal by spring. The picture was taken with PhotoBooth on the Mac, which, for reasons unknown to me, produces a mirror image. 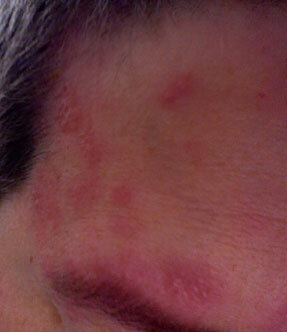 So, when I talk of having shingles on the left side, it’s true. On Friday I started taking famvir for an outbreak of shingles. I knew from previous times that famvir gave me a pretty bad headache, but I thought I’d do it anyway and maybe this time it wouldn’t happen. I withstood it for almost 4 full days, but then called the doctor to get something else. It was a wicked headache and I thought anything else had to be better. I got the rx for acyclovir Tuesday and took my first dose with dinner. Pretty soon I was experiencing nausea. Those of you who know me, know that this is a serious situation. I fought off the nausea for four hours and then finally had an episode of vomiting and diarrhea. It was over fast, and probably not worth the four hours I spent trying to avoid it. We do what we do though, and it’s hard to overcome a phobia you’ve had all your life. This could have very well been a coincidence, but I attributed it to the acyclovir (nausea, vomiting and diarrhea are reported possible side effects). I called my doctor the next day, and a nurse asked me if I could tolerate the famvir headache for just 3 more days. So, I’m back on famvir now. Just a couple of days to go. Afterwards, I will probably take one a day to help prevent a recurrence of shingles. The eye doctor told me that he saw no internal goings-on in my eye. Only the exterior was affected, including the eyelid (outside and inside). I have an antibiotic ointment to apply twice daily and a return appointment next week. I should expect to have a complete recovery anywhere from a few weeks to 6 weeks. I just learned that shingles’ name comes from the Latin cingulum, which means girdle or belt. There’s a lot of useful information about shingles at the FDA web site. 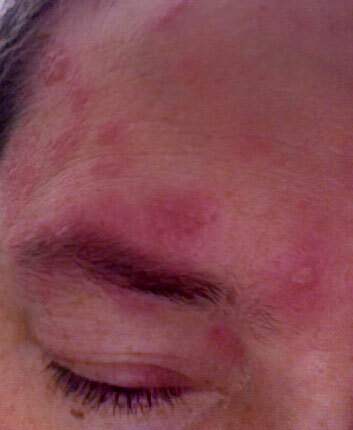 I’m seeing the doctor this afternoon about my left eye, which is afflicted with shingles. If an eye is ever affected by shingles, get to a doctor, asap! Here’s a new picture of what the rash looks like. Don’t click on the thumbnail if you don’t want to see it. I think it’s hideous. I try to stay in so that I don’t attract mobs of torch-wielding villagers out in front of the house. I’m still taking the 500 mg of Famvir three times a day and am taking some oxycodone as needed. I never thought I’d say this, but I wish I had some dex. I have a case of shingles AGAIN. 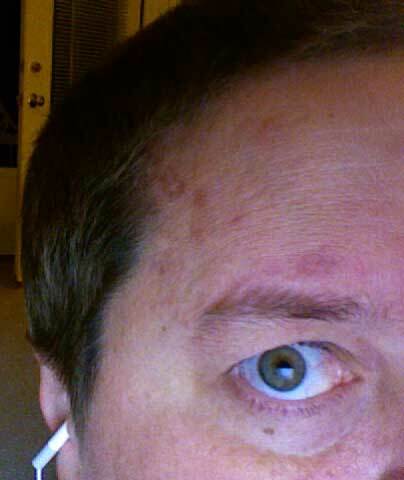 This time it’s on the left side of my head and face, affecting my eye. I’m on 500 mg of Famvir, three times a day. As my doctor said, it will get worse before it gets better. These pictures don’t really quite do it justice. More about shingles on this blog. What is shingles? There’s a really good explanation of shingles here on Wikipedia. Shingles (herpes zoster) is an outbreak of rash or blisters on the skin that is caused by the same virus that causes chickenpox — the varicella-zoster virus. The first sign of shingles is often burning or tingling pain, or sometimes numbness or itch, in one particular location on only one side of the body. 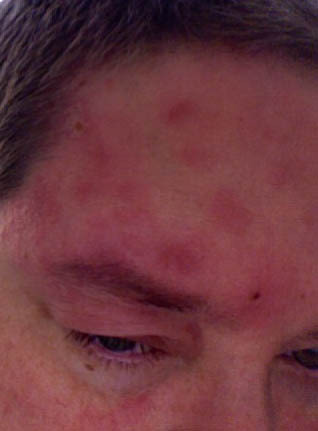 After several days or a week, a rash of fluid-filled blisters, similar to chickenpox, appears in one area on one side of the body. Shingles pain can be mild or intense. Some people have mostly itching; some feel pain from the gentlest touch or breeze. The most common location for shingles is a band, called a dermatome, spanning one side of the trunk around the waistline. Anyone who has had chickenpox is at risk for shingles. Scientists think that in the original battle with the varicella-zoster virus, some of the virus particles leave the skin blisters and move into the nervous system. When the varicella-zoster virus reactivates, the virus moves back down the long nerve fibers that extend from the sensory cell bodies to the skin. The viruses multiply, the tell-tale rash erupts, and the person now has shingles. I’m taking Famvir for my shingles, 3 times a day, for 7 days. This outbreak has manifested itself on my right arm and hand. You’d think I would have known what it was, since I had it a few years ago. I didn’t though, and was glad I showed the doctor. I have been struggling with rashes from Velcade & Doxil, so I was inclined to ignore it. The difference was that this rash hurt. The other rashes had pretty much cleared up after I started to get decadron and benedryl in my IV with each treatment, thanks to Eric’s suggestion. Famvir is something that’s prescribed for genital herpes, so I’m embarrassed when I go to pick my rx. Dumb as this is, I loudly ask the pharmacist if I need to take my shingles medicine with food. I’m skipping my dex dose again this week. The doc suggested that I not take steroids while I have shingles. It’s pretty much cleared up now. It’s nice not to have to take the dex, but I think my labs will show that my IgA has gone up. My total proteins are up, and I’ll know what my IgA is later today. I wish I could take a couple of months off.